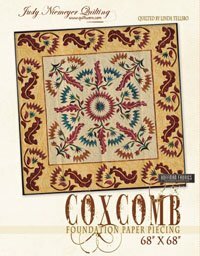 Judy and Brad Niemeyer designed the Coxcomb flower into a pattern for foundation paper piecing. A collection of fabrics designed by Hoffman Fabrics were used to make the quilt shown on the covers. This pattern includes enough foundation papers to make the quilt shown on the cover. It also includes the instructions and layouts for the applique.